E!Online described Shéna Ringö as Japan's answer to Courtney Love. "At times, she's nervously flirtatious like she's a teenage girl revelling in her nascent sexuality," E!Online's Andy Chen writes. "Other times, she ruthlessly exploits her femininity as a weapon in a battle of the sexes, cutting clueless men down to size in the process." Shéna had an early start in the arts, studying ballet and drama as a teenager. As the drummer for an all-girl band called the Marvelous Marbles, Shéna turned her attention to music. In 1995, she won a prize at the finals of the Music Quest competition. After living in Britain in 1997, Shéna returned to Japan to embark on her music career. She released her first single, "Koufukuron," in late 1998 and made her debut with Muzai Moratorium in 1999. Shéna released many more singles in 1999, leading up to the release of her second album, the ambitious Shouso Strip. Shéna's highly stylized sound mixes funk and hard rock with an arsenal of synthesizer effects. Her songs often veer from solid hooks to outbursts of noise. Ringo means "apple," a nickname she earned as a child because her face would turn red. After releasing a single ("Mayonaka wa Junketsu") in March 2001, Shéna gave birth to a son four months later and went on hiatus for the rest of the year. A year later, Shéna announced her return with the May 2002 release of a cover album, Utaite Myoori. 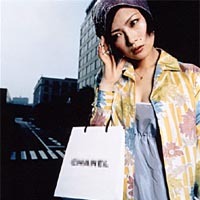 In February 2003, Shéna released her third studio album, Karuki Zaamen Kurinohana.